This is the last shade I got from Paradise Lagoon collection and this is my favourite one. Maybe it doesn’t look very original, but for me it’s great. 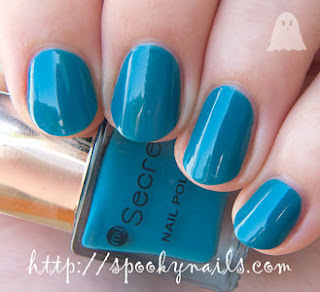 Most of teal blue shades like that are very dusty, but this one is actually quite bright. The formula is creamy, application was flawless (I used 2 coats) and it dries quick, so I can say that I had no issues with this varnish. Rzeczywiście, jakbym już gdzieś widziała taki kolor ;-) ale ich nigdy dość!